I was pleasantly surprised by this one. I had heard that America is annoying, but I didn't find her so. I wouldn't exactly call The Selection dystopian, as it doesn't really seem any worse than reality. This story is a beautiful conglomeration of elements from The Hunger Games, Matched, Princess Academy,Cinderella, The Bachelor and the biblical story of Esther. 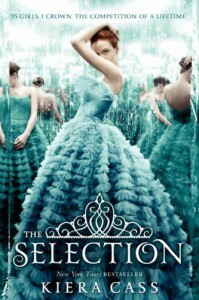 I'm sure there are more, but these are the stories I was reminded of as I read The Selection. The love triangle, in particular, reminded me of those in The Hunger Games and Matched. I love both Aspen and Maxon and have had a hard time deciding which one I want to be with America, just as she struggles to decide. I love the friendship between America and Maxon and at this point in the series, I want America to choose Aspen (despite his hissy fit) and remain a good friend to Maxon. There were other things that reminded me of The Hunger Games as well, such as the lottery, the payments to the families of the Selected,The Report along with its host Gavril, etc. The training to be a princess is what reminds me of Princess Academy and I really enjoyed that aspect of it as well. The gathering of women, some from less fortunate backgrounds, wearing dresses and competing for one man's heart was reminiscent of Cinderella and Esther as well as The Bachelor. It does contain the common mistake of using "Your Majesty" and "Your Highness" interchangeably, and the also common insistence that "even though EVERYONE says that I'm beautiful, I promise you, reader, I'm not even pretty." So, that was kind of annoying. I won't pretend this book is excellent quality, but it did its job as entertainment and I really enjoyed it. On to The Elite!